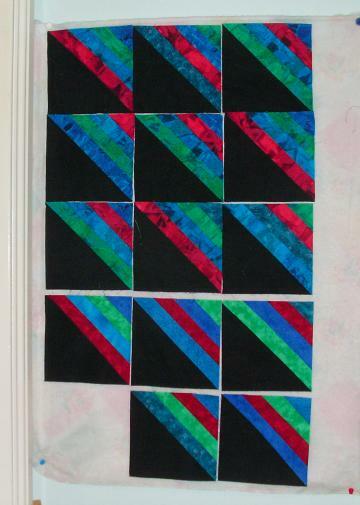 After making 31 blocks, I ran out of the original brightly-coloured fabrics for my sister-in-law’s Roman Stripes lap quilt. I need 80 blocks for this quilt. I no longer have any of the selvedge edges to see who the fabric maker is, and since this UFO is about 10 years old, I doubt this fabric would still be available, anyway. After rummaging around in my fabric cupboard, I was able to come up with some similar colours which I think will do nicely in this quilt. When the top is assembled and the blocks are mixed up in random order, I am hoping the differences will look like a deliberate design element. Fingers crossed! The top three rows are the original fabrics; the five blocks in the bottom two rows are the “new” fabrics. I think you’re right — it will look like a planned design element. Can’t wait to see all 80 blocks up there! I really don’t think you’ll be able to tell the difference between the new + old fabrics. You’ve done a great job!